Born in Michigan in 1922, Richard moved to Los Angeles, California in 1936. He studied at Chouinard Art Institute under the tutelage of Frank Tolles Chamberlin who influenced many of the young artists of that period. After leaving Chouinard, he pursued his painting at La Grande Chaumière in Paris, France for three years. While in Europe, he spent one summer in Florence, Italy copying master drawings in the archives of the Uffizi. Returning to California, Richard had a variety of jobs – motion picture sketch artist, head illustrator and art director in several aerospace companies. He was senior illustrator for the NASA space program where several of his illustrations won international awards. After leaving the space program, Richard moved to Arizona where for four years he taught portrait painting at Yavapai College in Prescott. 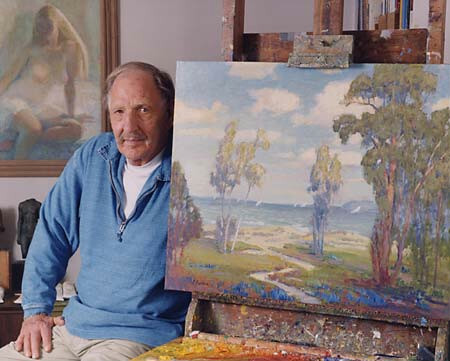 Richard returned to California in 1988 and settled in Ojai, using it as a base to capture the California landscape. Having studied under some of California’s foremost teachers and artists – Frank Tolles Chamberlin, Laurence Murphy and Sam Hyde Harris – it was natural for him to remain in the school of the California plein air painting. His paintings portray a broad range of California scenes. His distinctive style captures the subtle colors, the effect of sunlight and the mood of the landscape. Richard Rackus’ documentation took place in 1998. The FOTM Archive contains extensive information about this artist.